You would never know by me. Given a choice of precious or semi-precious stones, I lean toward turquoise or fire opal. But I have this diamond, set in my wedding band. 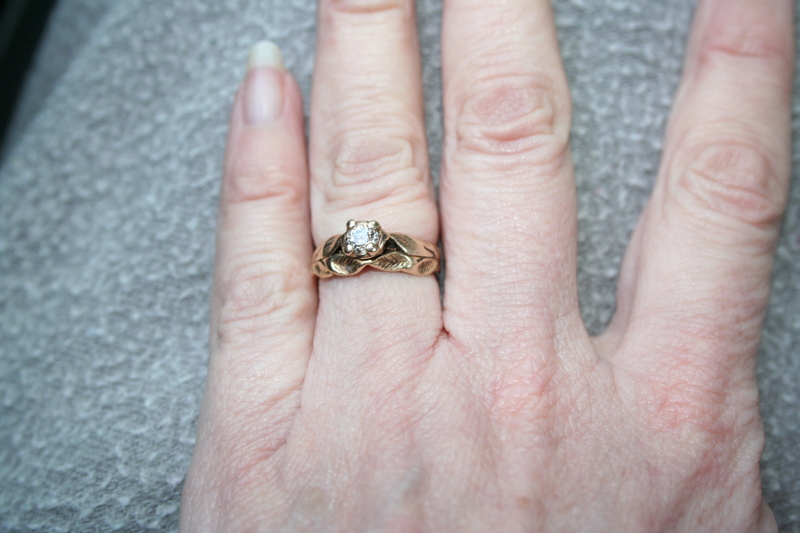 When Don picked out the wedding set, he chose according to his pocket book (of course, I had some say in the matter, which is why I have the antique-gold rose & leaf motif and not a princess setting. I didn’t want to be forever snagging sweaters. the diamond was an afterthought and was a quarter-of-a-carat. For years, I didn’t even have the set welded together. I had children by the time I decided I should weld the band to the engagement ring because the band was wearing differently than the engagement ring (isn’t that how it goes?). 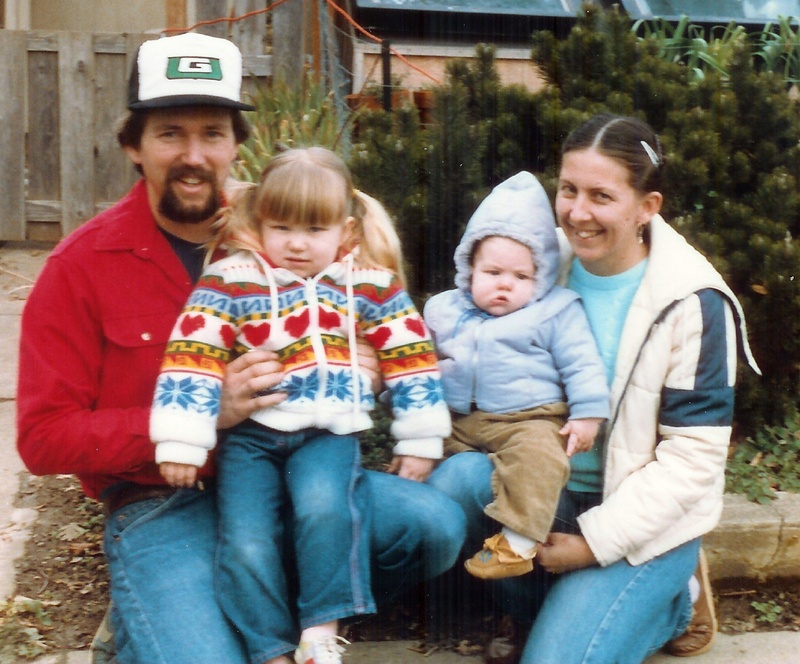 In 1996, on the day before Father’s Day, my mother died. She had a simple wedding band and engagement set with the diamond prominently displayed on a princess setting. My father handed the set and told me that I could have the diamond. It was his grandmother’s diamond, passed on to my mother after Irene Kimmey Wilcox passed away and John Timothy Wilcox I decided he rather liked this spunky Scotswoman his grandson, John Timothy Wilcox II, was engaged to. I had the diamond removed from the princess setting and placed into my ring. the head of the rose just holds it. It is twice the size of my original diamond (which I have in a tiny plastic bag, stored with the broken remains of my mother’s wedding set). It isn’t like I care that much about diamonds, anyway. The flaw gives the diamond character. 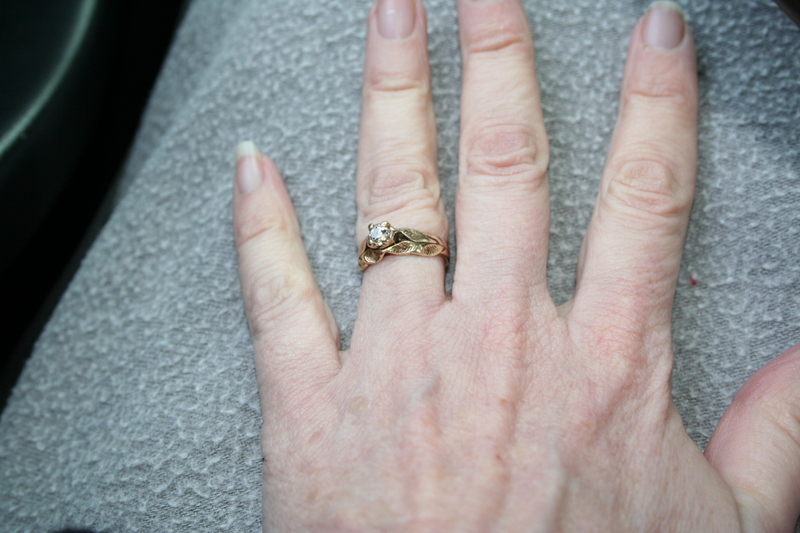 I harbor a lot of emotions and thoughts about the diamond I now wear on my ring finger: it was my mother’s, worn for 43 years. July 18, 1953. Grandparents Melrose (John & Emma) and Grandparents Wilcox (Fritz & Thelma) in the background. Mary Lou & Jack in front. You cannot see it, but she is wearing the diamond. My grandmother, Sylvia Cusick Wilcox, never wore the diamond. Great Grandmother was still alive, for one thing. And for another: Great Grandmother Wilcox outlived Sylvia Cusick Wilcox. 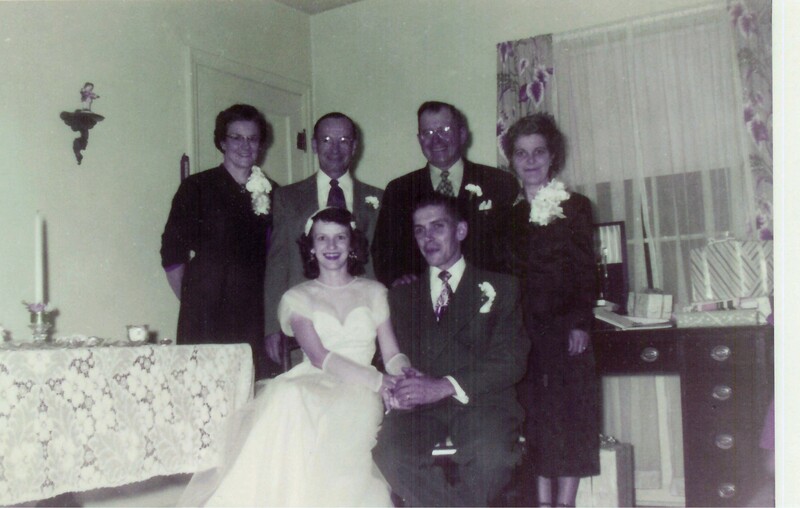 My dad’s mother died when he was a toddler, which is why Thelma is in the wedding photo above: my “Granny” as I came to know my dad’s step-mother. Before my mom wore it, Great Grandma Wilcox wore it. 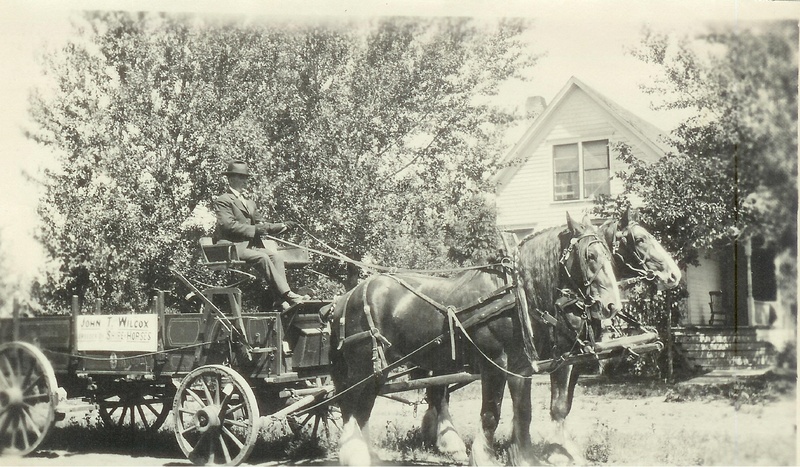 No photo of Great Grandmother, but I do have one scanned of John T. Wilcox I with his draft horses. He bought the diamond for his bride-to-be, possibly when she was still living in Illinois. I know so little of their lives. I know so much more about my mother’s life: her sisters are still alive and the family remains tightly woven together. They consider my father an honorary member and take turns checking up on him. Maybe someone can tell me if I am the third generation to possess the diamond, or am I technically the fourth? Does it matter? The diamond has a flaw in it. We have all had flawed marriages. I look at that diamond and it reminds me: we don’t have to be perfect to shine. We don’t have to be perfect to be pretty. We don’t have to be perfect at all. Marriages don’t always last. Mine has – so far. My parents lasted 43 years, but my mother was divorced before she married my dad. My grandfather, Fritz, lost one wife, divorced another and then was married to Granny (Thelma) until death. John T the First was only married to Irene Kimmey. The diamond may not be worth a whole lot of money with it’s tiny blue flaw in the form of a crack deep inside, but it is worth the family history. Maybe not my best friend (give me a horse or a cat or dirt under my fingernails from digging in the garden), but it has history. Speaking of fingernails: notice that I photographed my hand when I had nice nails? Yeah, that pinkie fingernail looks good right now, but I bet I break it off in a week… Happens everytime I get all my nails grown out and looking good: they start catching on things and breaking off. Such an interesting post; I enjoyed reading it. I love old things and family histories. Your ring set is lovely. Who cares if it wasn’t the most expensive, or if the diamond is flawed; it’s beautiful, and you must be proud to wear it. I love Arwen’s sweater and Chunky Boy’s moccasins.